I have Allison over at The Allure of Books to thank for this recommendation. I believe I had heard the title of this Victorian mystery bandied about some and never did chase it down on account of the title itself. Something to do with a proliferation of the so-and-so's wife titles at the time, I would imagine. But. I'm so very glad I listened to Allie and gave it a shot. Anna Lee Huber's series (which stands at three novels at the present time with a fourth due out this summer) is excellent. As you might have guessed, this series is a straight shot for you Deanna Raybourn and Tasha Alexander fans out there. While the Lady Julia Grey series is a touch more dramatic and the Lady Emily Ashton one quite a bit lighter, Kiera Darby is compelling entirely on her own merits and I can't wait to further my exploits with her in future installments. Lady Kiera Darby wants only to hide away and lick her wounds. Gone to her sister's estate in Scotland to recuperate from the tumultuous events of her husband's death and her own criminal trial, Kiera takes refuge in her painting and in the satisfactory distance she's finally put between herself and the prying eyes of London society. Unfortunately, her well-meaning sister and brother-in-law have planned a house party and invited some of the very elite members of society she so longs to escape. Knowing what they think of her and her role (albeit unwilling) in her husband's distasteful profession, each day becomes an endless struggle. But when a murder takes place on the premises, Kiera's skill is called upon by private inquiry agent Sebastian Gage. At first put off by Gage's somewhat pedestrian talent and clear suspicion of her, Lady Darby is reluctant to pursue the increasingly disturbing events at the estate. But determined to prove her own innocence, she concedes to work with Gage and the two fall into a competent and intriguing partnership. How I love Kiera. I love that the story opens after the horrible spectacle has taken place. The whole opening has an exhausted, almost gun shy feel to it as we come to know Kiera and gradually find out just what led to her ostracizing from society and the slow death she suffered at the hands of the most indifferent and cruel of husbands. 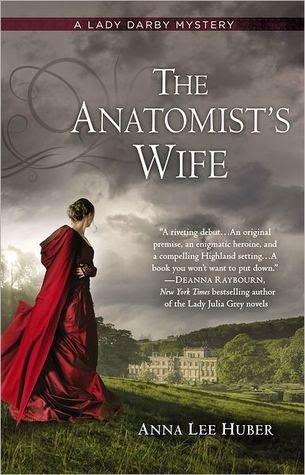 The entirety of The Anatomist's Wife is quiet. In the best sense. Quietly affecting. Quietly horrific. Quietly strong and hopeful. I was immediately fond of it and its occupants. Which brings us to Gage. I found him engaging (forgive me) from the beginning, though he does initially come off a bit of the fop to both Kiera and the reader. While unerringly confident, he doesn't ooze brooding arrogance in quite the same way that others of his ilk do. I wasn't sure which way the wind would blow with Gage. But I appreciated the healthy dose of skepticism that flourished between he and Kiera. And I unquestionably relished the accompanying slow, slow burn as their eyes were opened to how effective they could be as an investigative team, as well as how close they were growing as friends. Such partners they were. Such kindred spirits. I am with them. To the end. I'd not heard of this book/series before, but it sounds lovely (and beautiful cover!) - I'll have to check this out. Also, the first book of the Tasha Alexander series has been languishing on my TBR pile... really need to get around to it! Yes, she does have lovely covers. And I really enjoyed this quieter take on the Victorian mystery. I read the first 3, I think, in the Tasha Alexander series. I enjoyed them, but preferred this series and Raybourn's. Thanks, Sandy! I kind of blew through the three books. Love me some slow burn Victorian hi-jinks!